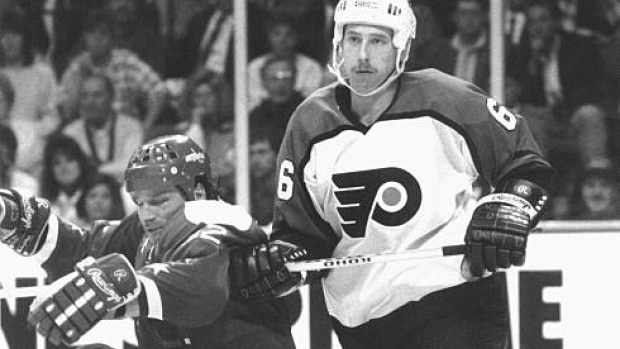 Nicknamed "Birddog," former NHL defenceman Greg Smyth has died at the age of 51. A native of Oakville, Ont., Smyth had been previously diagnosed with cancer. Taken in the second round of the 1984 NHL Entry Draft out of the Ontario Hockey League's London Knights by the Philadelphia Flyers, Smyth appeared in 228 career games over 10 NHL seasons with the Flyers, Quebec Nordiques, Calgary Flames, Florida Panthers, Toronto Maple Leafs and Chicago Blackhawks. He also spent three seasons with the Leafs' American Hockey League affiliate, St. John's Maple Leafs, where he became a cult icon. Smyth met his wife in Newfoundland and settled there after his playing days. Tributes poured in for Smyth from his former teams and teammates. "Greg was a tough and physical player who would go to battle for his team," Flyers president Paul Holmgren said in a statement. "If he lost a battle, he'd want to go again, as soon as possible," recalls Flyers president Paul Holmgren, who served as an assistant coach for the team when Smyth first broke into the NHL. More important, he was a good man. He was a battler off the ice, too. He fought his illness with all he had. He's going to be missed." Leafs president Brendan Shanahan, a teammate of Smyth's with the Knights in junior remembered him fondly. "Played with Birddog in London," Shanahan tweeted. "Thought my name was 'Rookie-(expletive)' my entire first year. So did my fellow rookie Matt....his little brother. 'Which one of you rookie (expletives) took the last Juicyfruit?!?' If you played with him, you still tell stories about him. A great character! RIP." Smyth tallied four goals and 16 assists over his NHL career.